Benjamin Pierce received a B.S. in Biology from Southern Methodist University and a Ph.D. from the University of Colorado. Ben is currently Professor of Biology and holder of the Lillian Nelson Pratt Chair at Southwestern University, Georgetown, TX. He is a population geneticist who conducts ecological and evolutionary research on amphibians. 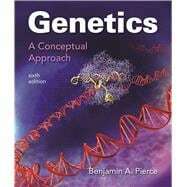 Ben has authored a number of articles in research journals and several books, including: The Family Genetics Sourcebook, a guide to genetics for the layperson; Genetics: A Conceptual Approach, a general genetics textbook; Genetics Essentials: Concepts and Connections, a brief genetics textbook; and Transmission and Population Genetics: A Short Course, a textbook for courses in transmission and population genetics. Ben is a member of the steering committee of the 21st Century Science Coalition, a group of scientists who support strong science standards for Texas public schools. He is the President of the Texas Academy of Science, is a member of Phi Beta Kappa and Sigma Xi, and is a Fellow of the Texas Academy of Science. He currently serves on the editorial board of Bioscience. He has received research and teaching grants from the Natural Science Foundation, the W. M. Keck Foundation, the 3M Foundation, the National Park Service, the Williamson County Conservation Foundation, and the National Geographic Society.